The National Gallery's new Leonardo exhibition has met with unprecedented public and critical accliam. Janine DeFeo reviews. 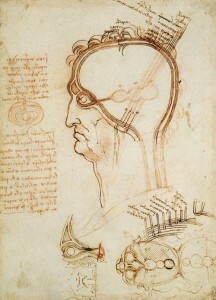 It is worth fighting through the crowds that stagnate at the entrance to the National Gallery’s ‘Leonardo da Vinci: Painter at the Court of Milan’ to have a close look at the first drawing in the exhibition, a pen drawing from about 1490 of the ventricles of the brain and the layers of the scalp. Leonardo slices away the skin and skull to show us a human brain that privileges sight – the eye is connected to three chambers in the brain that progressively gather information, process that data and then hold it as a memory. Leonardo’s artistic practice was animated by a deep faith in the importance of sight and perception, and a faith in the ability of the painter to represent that perceived reality (and all of this was connected to a deeply felt religious conviction, a sense of the perfection of God’s creations on earth). Perception for Leonardo was simultaneously natural and miraculous, and so was the painter’s ability remake what the eye had seen. How a man sees and understands what he sees was absolutely crucial for Leonardo, and his understanding of the human brain as expressed in his drawing can be seen to drive all the other images on display. In your first moments in the exhibition you are presented with an expression of pure, soaring faith in what it means to see and create. The National Gallery show, brilliantly curated by Luke Syson and Larry Keith, examines Leonardo’s seventeen years as court painter to Duke Ludovico Sforza in Milan, an evaluation that is long overdue. Leonardo’s artistic practice was enormously varied, but attempts to consider Leonardo as inventor, as draughtsman or as engineer have had the curious effect of obscuring Leonardo as painter. 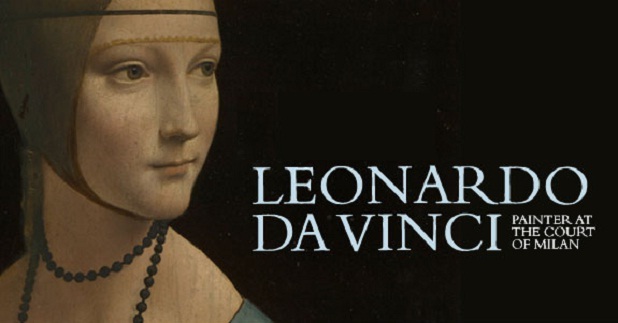 ‘Leonardo da Vinci: Painter at the Court of Milan’ does not seek to diminish Leonardo’s range of accomplishments as the quintessential Renaissance Man; instead, the show suggests that it was in his painting that Leonardo worked out the details of his theories and investigations and tried to prove them. His restless imagination took real form in his paintings, which portray the world with a kind of magical realism. Leonardo’s great accomplishment as painter, as Syson writes in the exhibition catalogue, was his ‘pioneering combination of detailed naturalism…with something that is deemed new: the “divine grace” that – with the artist seeking to surpass the beauties of nature – could take painting into the realm of the otherworldly.’ Leonardo needed space and support for his explorations of the potential of representation, and he found this under the patronage of the Duke of Milan. Freed from the commercial imperatives of artistic production in Florence, Leonardo could indulge his meandering vision. The National Gallery’s decision to focus on Leonardo’s years in Milan is impeccable – by looking at these two decades of work, you begin to understand Leonardo’s whole practice. The breathless excitement that has accompanied the exhibition (the Guardian called it a ‘once-in-a-lifetime show’) has thankfully been rewarded. The show is beautifully, carefully organized; the tight historical remit allows for a thematic investigation of Leonardo’s work in Milan that is consistently revelatory. For example, in a room of Leonardo’s portraits of women, you can see the quiet revolution he touched off in Milan, moving from stiff, old-fashioned portraits in strict profile to the incredible vitality of The Lady with an Ermine (1489-90) to the restrained harmony of geometry of The Belle Ferronniere (about 1493-4). The paintings are punctuated by his drawings, which show him developing the technical details of the finished paintings but also their theoretical underpinnings, as he tried to figure out a way of creating an image that both convincingly imitates the natural world and surpasses it. The exhibition is an experience of museum going as a privilege. Shortly after you finish in the room of female portraits, you find yourself between the two versions of the Virgin of the Rocks, where Leonardo applies his careful observation of nature to representing the divine. As the exhibition catalogue notes, these two paintings were probably not seen side-by-side even in Leonardo’s own time; the first version, finished around 1485, is normally in the Musee du Louvre and the second, finished around 1509, is from the National Gallery’s collection. 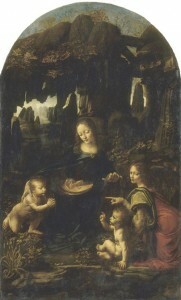 Because paintings by Leonardo are so rare (he notoriously never finished anything, and his experimentations sometimes had disastrous consequences – the new kind of paint he developed for the Last Supper began to deteriorate almost instantly), they are inevitably the centerpieces of the collection of any museum lucky enough to have one. The fact that the National Gallery has managed to include nine paintings by Leonardo in this show is literally incredible, and not likely to happen again. The paintings are shown with his drawings and work by his followers, amounting to the most complete assessment of Leonardo’s work as a painter ever. This is a show that, quite rightly, knows its own importance. But the curators restrain themselves from providing too much distracting or dulling text. A wall text will identify when a gesture from a drawing reappears in a painting, but the viewer is allowed to see it for themselves. Generally, Leonardo’s drawings include an range of images – a man’s face in profile shares paper space with a quick sketch of a figure on horseback and lines of mysterious text (Leonardo wrote so that his writing could only be read reflected in a mirror, which has the effect of turning his words on the page into delicate little abstract patterns). All of this is part of Leonardo’s project, and the National Gallery allows you to get distracted along with the artist as he tries to capture the elusive beauty of the physical world. Particularly in his drawings, where he could escape the conventions of polished completion, you can feel his mind at work, searching for ways to order his thinking visually. And this process is a beautiful sort of alchemy in its own right; Leonardo was trying to put perfect form to the perfection he saw in the world in front of him. His drawings and paintings show him to understand the role of the artist as more than a mere recorder of nature, although careful observation and study were important to him – in representing the beauties of nature, the artist becomes creator of his own dizzying beauties. Tickets: Advance tickets have sold out, but the National Gallery sells a limited number of tickets on the day of the exhibition, available from 10 AM. Janine DeFeo writes about contemporary art and cultural production. Query . For those of us who cannot even travel to London, let alone get a ticket. Are you going to let us at least see the paintings on your website; at least to see them at that distance would be better than nothing ?